Vaseline Radiant Body Gel Oil: The key to this product is-- a little goes a long way. Which is great, because this bottle has lasted me well over a year! It smells like cocoa butter and makes my legs look so shiny and smooth underneath the bright sun, without feeling sticky and greasy. Definitely has been one of my favorites for years. e.l.f. Studio Lotion Wipes: These wipes are a must for the on the go girl. They come in all different scents and one wipes is enough for your entire body! All you have to do is run the wipe over your skin and voila- you're moisturized and smelling amazing. Not to mention, they're so inexpensive. Only $3 for a pack of 15! Jergens Natural Glow Moisturizer: For years, women have been searching for an at-home self tanner that smells good and leaves no unpleasant traces. So when this product came on the market, it was pretty much revolutionary. The smell is more of a lotion than a self tanner and because this product darkens your skin little by little, there's a very small chance that you'll be left with unsightly streaks. 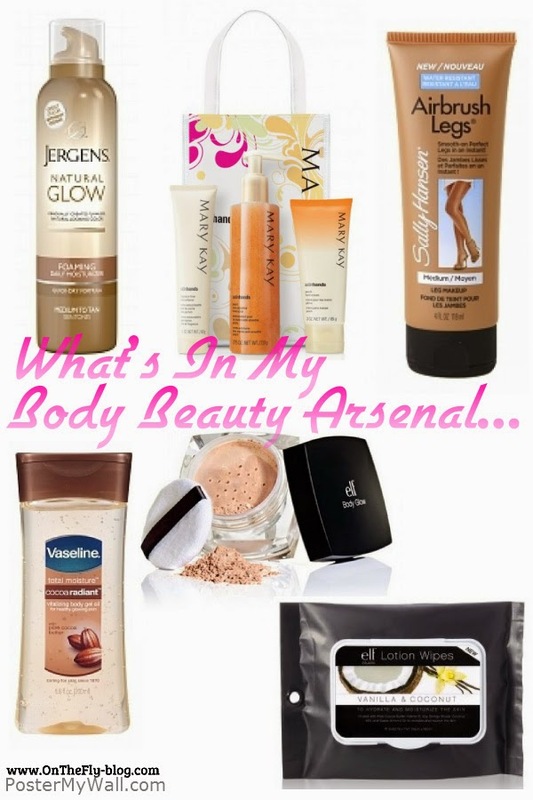 They have tons of the Natural Glow products, but so far, the foaming one has been my fav! Sally Hansen Airbrush Legs: This is a product that I have yet to try but I've heard AMAZING things about it. It's literally makeup for your legs. Smooth it on and it hides imperfections and gives you a nice moisturized glow. Not to mention, it's water resistant and won't rub off on your clothing! Great for touching up those non-sunkissed legs in the winter months. e.l.f. Studio Body Glow: This powder has a bronzing and shimmering effect that can make any part of your body look spectacular. I like to use it on my collarbone, chest and arms, but really, you could use it anywhere! It's great for a casual day outside or for a night out on the town. By the way, it's only $6 and will last forever. Mary Kay Satin Hands Set: Want soft hands and feet? This is the product you must try. The set comes with 3 different treatments- an exfoliator, a lotion and an overnight cream. Use on any rough spots and I promise you, they'll feel smoother instantly. And of course, the longer you use the products, the more results you'll see. I've been using this set for years and it never disappoints! Want to see what I have in my Makeup Beauty Arsenal? Check out this post! What products do you keep in your beauty arsenal?